Srinagar: Hurriyat Conference (G) chairman Syed Ali Geelani has strongly condemned the media reports about government’s decision of banning the civilian vehicular movement on Jammu-Srinagar highway for two days in a week from 4 am to 5 pm and allowing exclusively the military movement on these two days. 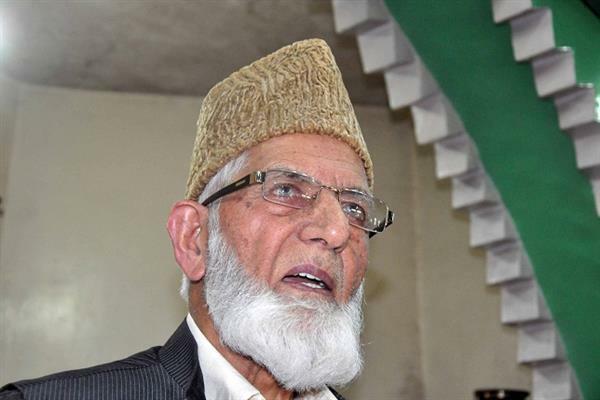 “After creating graveyards in length and breadth of the state, rulers in Delhi very brazenly try to strangulate the common people, which can have catastrophic ramifications,” Geelani said. He said roads are means of connectivity and are not only used in normal life, but are of prime importance in some desperate and emergency situations. Curtailing and banning such a basic and fundamental lifeline amounts to gross and unforgivable crime against helpless population, he said adding that it is better that they close all educational institutions, healthcare system, offices, and universities and seal the residences so that only the armed forces can roam around.